UNITED NATIONS, October 29 -- In the run up to the election of six International Criminal Court judges set for New York in December, France offered to support a candidate found to be unqualified if his country would support the French candidate Bruno Cathala, Inner City Press has learned. There are 19 candidates for the six ICC judge seats. They were reviewed by the Independent Panel on International Criminal Court Judicial Elections and four -- from Tunisia, Cyprus, Costa Rica and Mexico -- were found to be "unqualified." The Panel's members include not only South African justice and international prosecutor Richard Goldstone, and ICTY and US judge Patricia Wald but also former top UN lawyer Hans Corell. Nevertheless, when one of the "unqualified" candidates met with France to try to make his case, he tells Inner City Press that he was surprised to be offered a deal: that if his country committed to vote for the French candidate, he could count on France's vote. France styles itself a champion of international criminal justice and accountability. 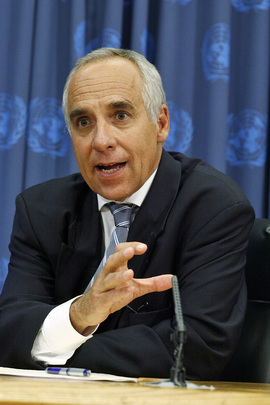 But just as it asserted itself to place atop UN Peacekeeping Herve Ladsous, the chief of staff of foreign ministers Alain Juppe and Michele Aliot-Marie including when she flew on planes owned by cronies of Tunisian dictator Ben Ali, it is seeking to its candidate Bruno Cathala as a judge on the ICC. Will it work? Beyond this quid pro pro, when Inner City Press previously asked Cathala when he was ICC Registrar about immunity given toLaurent Nkunda in the Kivus in the Democratic Republic of the Congo, he replied that the ICC was not part of the negotiation of that immunity which, he claimed, did not include war crimes or other ICC-relevant crimes. Cathala quoted the ICC's deputy prosecutor (and now candidate to replace Moreno Ocampo) Fatou Bensouda that the ICC's phase of investigation in Ituri was over. But indicteee Ngudjolo's co-warlord Peter Karim was and is still in the Congolese Army, despite having kidnapped and killed UN peacekeepers. Since Karim ultimately released some of the peacekeepers, it appears that he got some deal. So even beyond the quid pro quo, there are further questions to be asked. Inner City Press' series on the ICC and ICJ judicial elections and needed reforms will continue. Watch this site.